"Are you like so many? Who run away from a regular life, and then yearn for it? Yearn for what they do not want..."
La Cucaracha is perhaps best described as a piece of modern film-noir. Ithas that same kind of edge that classic noir has, and the characters seem toperform their best only when in shadow. In fact, every one of the major sceneshere take place in near complete darkness. Director Jack Perez has seeminglychanneled a great deal of inspiration from the noir classics of the past, but alongwith writer James McManus, he has also managed to give things a clever twist. The film tells the sordid story of Walter Pool (Eric Roberts), a down-and-out nobodywho has taken up residence in a small Mexican town. He wants to live theexpatriate writer life, like Hemingway, but the fact that he's penniless and a constantdrunk makes it a laughable attempt at greatness. He lives in a broken shack, andspends his days passed out from hunger in a local cantina while fantasizing a lifewith a beautiful local woman, whose name he doesn't know. One day, Pool meetsthe charismatic Louis Grace (James McManus), who offers his friendship. As ajoke, Pool insists that he's hiding from the law because he killed someone, so Gracereveals himself to be a friend of the mysterious, local crime boss, Jose Garras(Joaquim De Almeida). Grace offers Pool $100,000 if he will kill a man for Garras. Pool accepts, but he foolishly plays the part of the brutal mercenary, even thoughhe can barely use a gun. La Cucaracha is a fiercely entertaining update of classic pulp stories,where the desperate man takes the extreme gamble for success. This filmmanages a unique view on this subject by adding a lot of moral groundwork. SincePool is just pretending to be the tough assassin, he actually has a problem with howexactly he'll deal with all these shady people. Eric Roberts gives an excellentperformance as this character, since he embodies the "average joe" so well. He'slikable, but at the same time he's also incredibly sleazy in his desperation. 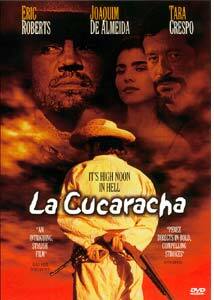 JoaquimDe Almeida delivers his usual outstanding, frightening performance as a mysterioustough guy. Maybe he's played a few too many villains in his time, but at least heplays them very well. Writer/actor James McManus rounds out the central castvery well as the dodgy and smug mouthpiece for Jose Garras. The movie manages to keep a very intense mood, which is mainly thanks to howone can relate to Walter Pool. He really could be almost anyone, and being put intothis winding situation of crime he reacts in ways that many of us might react. Thanks to this human aspect, La Cucaracha will undoubtedly surpriseeven jaded viewers with some of its more interesting twists. While there's thefeeling of classic movies like Touch of Evil or Bring Me The Head ofAlfredo Garcia, there's a deeper emotional feeling here. This isn't just somegeneric shoot-em-up. It's got a skill and craft behind it that brings out the best in anexcellent cast and great story. Image Transfer Review: The full-frame image here is extremely good. Despite some slight pixelization,overall the picture is very impressive for full screen work, especially with a such alow bitrate. Blacks are very well defined and highlight the color very well. The filmuses very specific cinematography, where light is often used in very accurate ways,and the excellent black level helps work with this. 1:33:1 is also the original aspectratio, so widescreening is not an issue. Audio Transfer Review: La Cucaracha has one of the most outstanding Dolby 5.1 mixes I haveever heard. The funny thing is the movie isn't really even all that action based. Everything from ambient sounds to musical score material are simply gorgeous. Dialogue is nicely separated from the rest of the soundtrack, and all channels areused for a variety of things. The audio is incredibly dynamic with all sorts ofdirectionality and surround effects. From the sounds of bugs rustling in theevening, to echoes in caves, to blaring mariachi music, the 5.1 is superbly blendedso that you are truly surrounded by the film, rather than a lot of specific actionbased exclusively on what's going on in the movie. The 2.0 Pro-Logic track can't really compare to the 5.1, but it certainly is good. Itlacks the complete immersion of the 5.1, yet delivers a very solid sound mix thatPro-Logic users might want to take advantage of. Extras Review: The highlight of this disc is the commentary track by Eric Roberts and director JackPerez. The track uses a technique I wish more DVD commentaries would, wherePerez' voice comes out of the front right speaker and Roberts' voice comes from thefront left. Thanks to this technique, it not only makes the commentary a little moreimmersive, but it also allows the listener to easily distinguish who's talking whentheir voices overlap. The commentary is a very interesting and an extremelyinformative look at the making of the film. For example, despite the fact the filmvividly depicts a hot, sweltering Mexican town, the film was actually shot in thewinter with freezing sets. The track is also pretty casual, and the two joke aroundaccordingly over various topics. The disc also features lengthy bios on all of the actors and main crew, as well theoriginal trailer. (Did this ever release theatrically??) The keepcase isn't terriblyartistic, but the animated menus make a nice stylistic choice. I will voice acomplaint, however, about the actual holding case. It's one of those newer Amaraycases with the "press here to shred your fingers to bits" holders, much like the CDgrip in a standard jewel case, except MUCH tighter and with VERY sharp plasticgrips. Oddly enough, this disc comes from Paramount whose reputation for presentationis not exactly the best (see my previous Paramount review of Star Trek II: Wrath of Khan ). Despite being a low-budget indie production, the overall presentation here isextremely good, and the commentary track makes a nice compliment. On almostevery level a film can surprise, this one surprised me. It's a fascinating drama witha nice, dark edge to it. Highly recommended.